In this case, severe atherosclerosis in a patient with diabetes mellitus led to severe aortic atherosclerosis with renal arterial stenosis as well as nephrosclerosis and nodular glomerulosclerosis of the kidneys. Thus, the native kidneys seen here are both small. 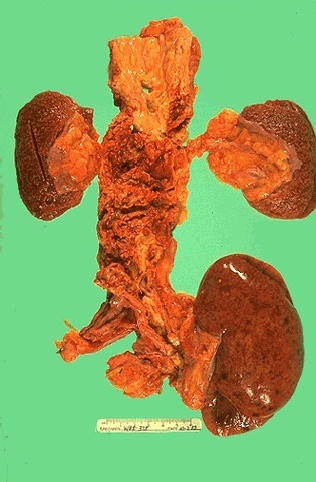 The end stage renal disease was treated with renal transplantation. The transplant kidney is placed in the pelvis because this is technically easier and there is usually no point in trying to remove the native kidneys. In this case, the patient developed chronic rejection and that is why focal hemorrhages are seen in the transplanted kidney that is slightly swollen. A radiographic study would show decreased renal blood flow in the transplant kidney.